All ecommerce websites that offer products or services for sale will normally have a refund policy. This policy can be a standalone policy listed on a separate page, or included as a paragraph in the Terms and Conditions. 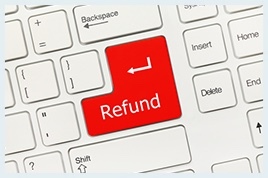 It is always recommended to read the Refund Policy of any website before purchasing a product or service. A refund can either be full or partial depending on Terms and Conditions of the product you purchase. You might be charged a handling fee in order to receive your refund. If you have used a credit card issued in a different currency, the bank or credit institutions exchange rate will be used at the time of purchase to determine the price in your local currency. Some card issuers also charge a foreign exchange fee, which is normally listed as a separate charge on your statement. Disclaimer: ESTA-America.org is not affiliated with any U.S. Government agency. ESTA-America.org is a U.S. Travel Authorization service and submission provider. The information on this website is for information purposes only. We do not provide legal advice. Please review our Terms and Conditions for more information. Please add info@esta-america.net to your address book to ensure that you receive our emails.